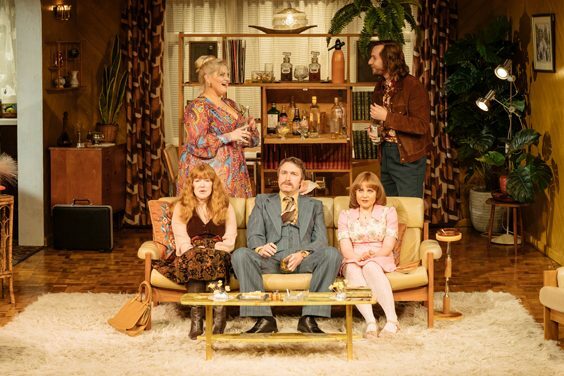 Abigail's Party – Review. York Grand Opera house, January 2019. I’ve been a fan of Mike Leigh’s work for longer than I can remember. I’ve spent years quoting lines from his classic films Life is Sweet and Naked, while TV offerings such as Nuts in May and Abigail’s Party are also woven into the fabric of British comedy history. The latter, first televised in 1977, was a glorious satire which gave the likes of Alison Steadman and Benidorm’s Janine Duvitski two of the best roles of their careers. It’s something of a dream on stage because of the fixed set – a masterpiece of forced perspective which gives it far more depth than the theatre would normally allow. Watching Jodie Prenger swaying to Donna Summer’s ‘Love to Love You Baby’ in the opening scenes brings all those memories flooding back. But when I think about it, how much of the play do I actually know? Aside from lead character Beverly dominating proceedings like some sort of suburban social ringmaster, arguing with estranged husband Laurence, while endlessly topping up the glasses of willowy guest Sue, neighbour Ange and monosyllabic husband Tone, I realise not much. Classic one-word lines such as: “DoyoulikeDemisRoussos?” are just the tip of the iceberg. And then I realise it must be 20 years since I last saw it, probably during the BBC’s Abigail’s Party night, back in the days when they used to have themed evenings. So for this Leigh fan, it’s actually a bonus that I don’t know the show as well as I thought. And the fact is that’s probably because not a lot happens. 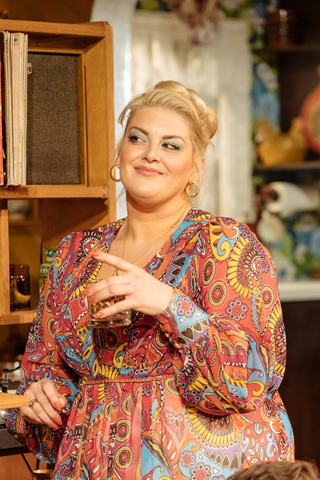 Beverly, a powerhouse performance from Ms Prenger, argues with her husband a lot, albeit with death stares and passive aggressive behaviour; flirts with Tony; patronises Ange, and wields power over divorced Sue like a hammer. Except there’s little depth to Bev. 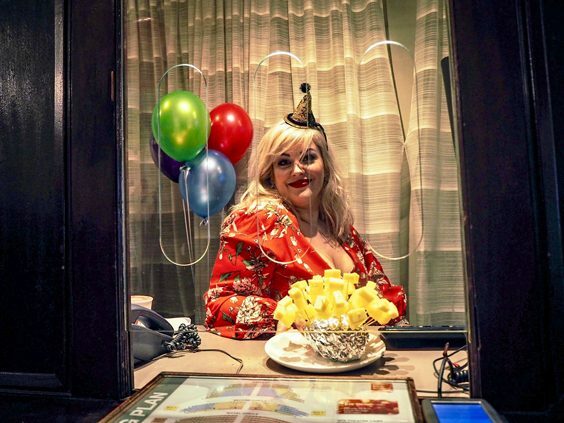 She’s one of those people who is outstanding when it comes to hosting a soirée and keeping everyone’s glasses topped up, but scratch beneath the surface of the facade, and she’s empty. When things take a dark turn later in the show, she’s all bluster and hot air. Director Sarah Esdale does a fine job of keeping things ticking over, which is not easy when part of the show relies on awkward, uncomfortable silences. Daniel Casey (Laurence), Corrie veteran Vicky Binns (Angela), Calum Callaghan (Tony) and Rose Keegan (Sue) ensure there’s rarely a dull moment. Okay, the cast were a little drowned out by the music in the first few minutes, so a little more volume would have helped for those of us in the Dress Circle, but it didn’t detract from the entertainment too much. It’s easy to do this sort of thing badly, poking fun at the relatively affluent 1970s middle-aged set. Had it been penned now, a lesser writer would have thought a few mentions of Vesta curries, Double Diamond, eight-track tapes and Sacha Distel was enough to keep viewers of a certain age entertained, but it’s a far more subtle drama than that. And like so many classic shows of the era, I’m surprised it hasn’t been turned into a musical. It’s almost begging for it, but the inertia of Leigh’s work is what makes the material work. Tone doing very little for the bulk of the show (as he’d rather be anywhere else) is as important as Beverly being the driving force behind the narrative. She’s the personification of that pre-internet era when three TV channels, LPs and no VCRs ensured that social gatherings were more the norm rather than creating a social channel on Facebook. Leigh’s working practices have become the stuff of stage and film legend. Glorious improvised sessions in which actors get under the skin of their characters and the narrative is shaped around them. So as much as Leigh is the author, kudos must also go to the likes of Alison Steadman and Janine Duvitski who helped craft this glorious satire more than four decades ago. Fashions and style may have changed, but the core of the drama is still very relevant. Even if you have no idea what Pomagne is, Abigail’s Party is a fizzy, bubbly concoction that might be more dated than disco, but not in a bad way. We all know a Beverly, whether male or female, and she’s the key reason why the show works so well in any medium. As great as the cast are, It’s testament to Jodie Prenger that I could have watched the whole show with just her on stage, and the others just heard as voices in the wings until those final few minutes when things go pear-shaped.